Back in 2006, I was a weird kid. That's why the special Volvo Ocean Race Editions of their cars somehow interested me. Hey, it was an XC70 with a ridiculous navy blue interior bits, which was odd at the time. 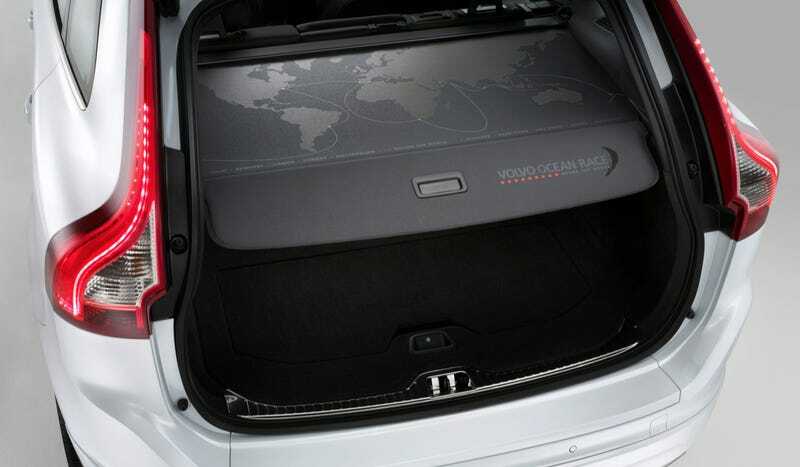 But the Volvo V60 comes with a map of the world print, so the weirdness continues. The special package, offered on the V60, XC60, XC70 – as well as the V40s and V70s we don't get here – is made up entirely of cosmetic enhancements to recognize the 2014-2015 Volvo Ocean Race, which the company says is one of the most grueling nautical events. One of those upgrades is a cargo cover with a map of the world printed on it. It reminds me of those shower curtains with a similar print on them. American children could learn where so many more countries are if more cargo covers had a similar theme. Ocean Race cars also get orange accents inside. I hope this is a sign Volvo is really big on orange accents in production cars like they were on the awesome Concept XC Coupe from Detroit. All of your cars need some orange, Volvo. The interiors don't come in blue this time, which is a shame. From the outside, though, there's not much going on with the Ocean Race-ers. There's also no official word on whether they're coming to the U.S., but Volvo's going to make 16,000 of them starting this spring, so there's a chance.